CARMEL, Ind. 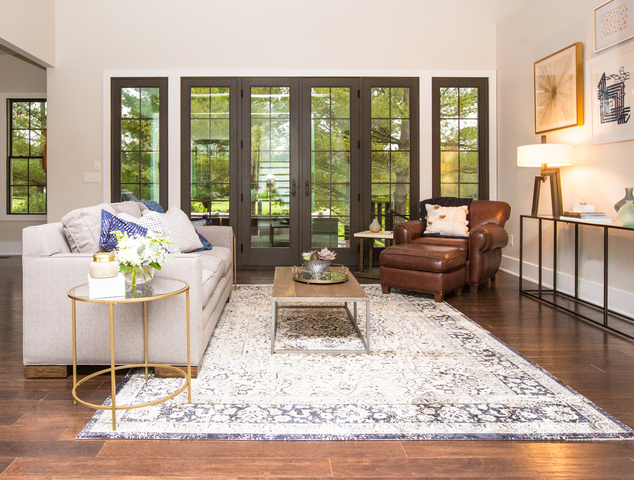 -- Seth and Heather Ireland's 5,500 square foot home on the Bridgewater Club golf course in Carmel was designed with the open floor concept as a prime focus. The Irelands have a 15-year-old son who attends Westfield High School and a 13-year-old daughter who attends Westfield Middle School, so they need all the space of their 5 bedroom, 4.5 bathroom house. Their inspiration in the home came from Houzz.com . The family's favorite design elements are the windows everywhere, which are very appealing being on the golf course. 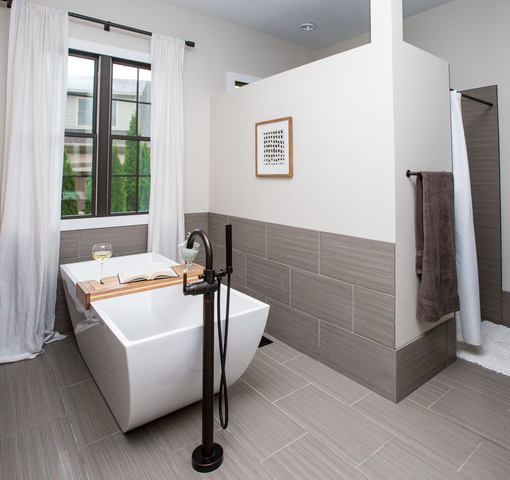 The soaking tube with window and walk-in shower in the master bathroom are luxurious. They also love the countertop to ceiling tile in the kitchen. 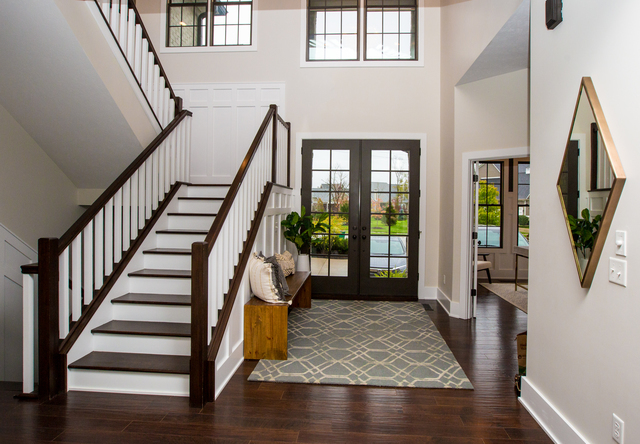 They also mentioned loving the black-framed windows and doors - it's one of their favorite design elements. Their biggest design challenge was the desire to have a staircase from the garage to a room above it. This led to pushing the house closer to the course and not allowing a lanai on the outside. Since they have such an open floor plan, it was crucial that all the rooms flow, yet stand out on their own. The family is proud of all the DIY they did. Seth did all the trim work, tiling and flooring in the house. They are proud of every inch. He's a perfectionist and the family says it looks great. They are now putting a bar and built-in entertainment center in the finished basement and he is custom making it all from pictures they find (master bedside table, foyer bench, shelf unit in son's bedroom, etc). The family bought a dental practice from a retiring dentist in 2009 and he had some really neat antique equipment. They kept two dental cabinets and Seth refurbished a very unique one that is on the second floor landing. 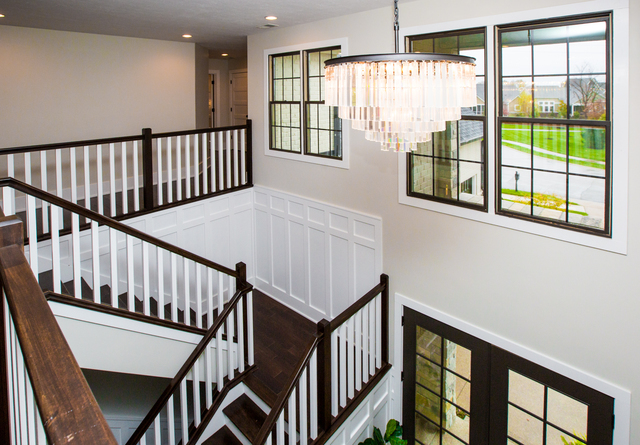 The biggest indulgence on the home is the chandelier in foyer. Hardwoods throughout with no carpeting (only rugs), too. 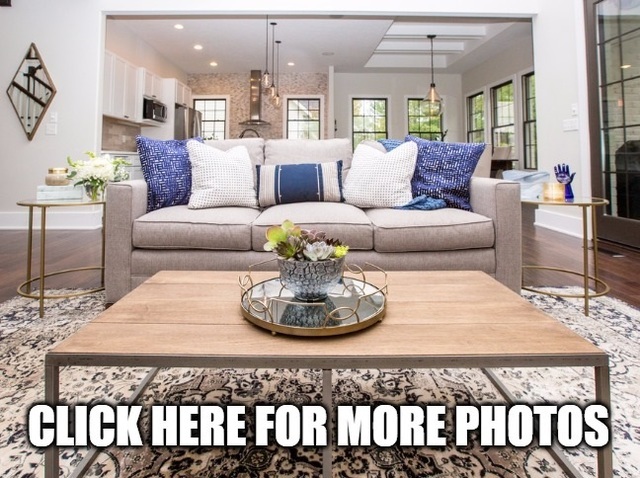 They selected several pieces from their designers - only lines - these items are only available through an Interior Designer and are the highest quality you can find. Most are customizable, which allows them to create the perfect look for each project. Their best design advice is that it's OK to mix metals, woods and textures. “The best design advice I've ever heard is from one of my favorite Interior Designers, Nate Berkus: 'Your home should tell the story of who you are, and be a collection of what you love.' Regardless of trends, you should always remain true to your unique style. I also believe that your furniture should be relatively timeless and neutral so it lasts as your taste evolves, so it pays to invest in quality pieces," said Heather. “I like to look at rooms that are already put together, like Restoration Hardware but many unique and fun finds are online or at Home Goods. These stores overwhelm me though because I can't choose what goes together or doesn't,” said Heather. Their favorite places to shop are from designer-only lines. They love finding the perfect finishing touches at antique shops in the area - every home should have a few antique pieces in it to help the design remain timeless. About their designer: Alison Baldea with Alison Noel Custom Interiors . They had the bare bones of the house but needed help with final touches of the decor. Everything that was proposed, they loved. Some things they could not make a final decision on so they left it up to Baldea and were never disappointed. “I found inspiration in the existing elements of their home - from their rustic custom-built furniture pieces to their collection of contemporary artwork, I got a sense of their unique taste and style which helped me find the perfect finishing touches for their home,” said Baldea. Baldea will be a featured Interior Designer in the 2018 Decorators' Show House and Gardens, which will run from April 28 - May 13. She started her firm in 2015 after a drastic career change from advertising.